Welcome back to the Critter Wranglers blog! If you caught our last blog post, 5 Facts About Skunk Mating Season In Tennessee, you learned some useful information about skunk breeding season. From now until spring, skunks will be a common site — and smell — here in Powell, Knoxville, Friendsville, and across the entire state of Tennessee. This means that skunks will be searching for cozy places to set up a den, mate, and give birth to their annual litter of 2-16 kits. Want to learn the secrets to keeping skunks away from your home? Here a few tips you can follow to safeguard your home from the smelliest of wildlife critters. Should skunks take up residence in your home, reach out to Critter Wranglers for a Top Rated Local® skunk removal and other wildlife removal services. If a skunk comes across a hole in your yard, they’ll easily turn that hole into a den. Skunks have sharp claws and are excellent diggers, so if you have exposed holes in your yard, these will often attract skunks. Fill any holes in your yard and gardens with dirt, decorative rocks, or use mesh fensing to help keep the skunks away. Skunks love pet food, especially the crunchy kibble you feed your dogs and cats. While some dogs and cats are “outdoor pets,” it’s a good idea to feed them indoors, especially during skunk mating season. This will eliminate the possibility of spilling food in the yard, dog runs, or on porches, which will most likely attract skunks seeking out food. Like raccoons, skunks are curious, they’re great climbers, and they will do what it takes to access a food source once it’s been found. Secure your trash cans and recycling bins with bungee cords and/or snap-shut trash can lids that are wildlife-proof. Pick up any stray trash items around the waste bins and for an added level of security, elevate trash cans off of the ground by placing them atop a pallet or trash can pavers. If you hear rustling noises in your yard during the day or night, making loud noises can startle the skunks and get them to move on if they haven’t set up a den. Now, you’ll want to be extremely careful when doing this, as skunks can shoot their nasty defensive spray 10-15 feet. Yell, clap your hands, bang pots and pans together, stomp, or even use an air horn to scare skunks away. 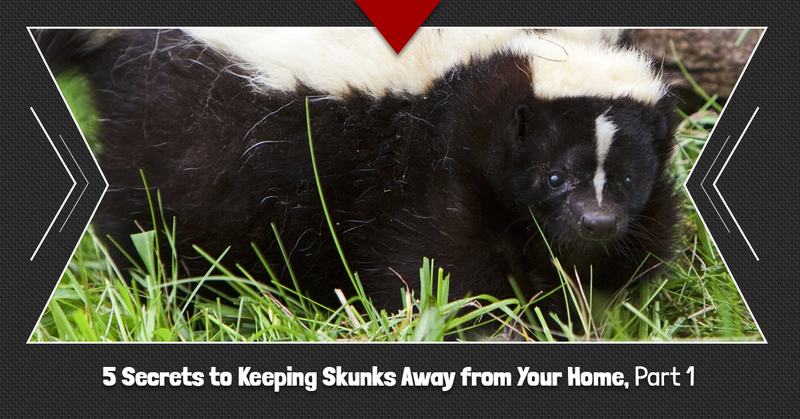 Your neighbors might turn up their noses at your actions, but at least you can deter pesky skunks away from your home. Wildlife critters like smelly skunks won’t just go away on their own once they’ve taken up residence on your property. Rather than attempting a DIY skunk removal that could get dangerous and very stinky, call the wildlife removal experts at Critter Wranglers. We offer quick, efficient, humane skunk removal services so you don’t have to worry about getting sprayed by a skunk, or worse, injured by a scratch or a bite. Take back your home with a Top Rated Local® skunk removal in Powell, Knoxville, Maryville, Alcoa, Friendsville, Louisville, Rockford, Seymour, and beyond!